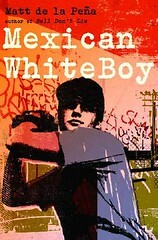 Biblio File: Books about Boys and cultural identity. And boys. Did I mention boys? Books about Boys and cultural identity. And boys. Did I mention boys? 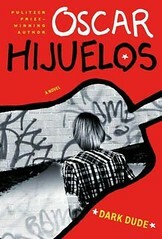 Set in the late 60s, Rico is fed up with being the only Cubano in Harlem who's blond, light-skinned (he has freckles!) and hazel-eyed. Couple that with the fact that he was really sick as a child and spent a lot of time in hospitals and subsequently speaks messed up Spanish, and people have a really hard time believing Rico's Latino at all. He's sick of being beat up for his looks. He's sick of the kids at his school venting their frustration at whitey on him. When his friend Jimmy becomes a serious junky, Rico decides it's time to take a cue from Huck Finn, and runs away to a buddy's farm in Wisconsin. In Wisconsin, Rico blends in and doesn't need to worry about his heritage, although he does miss his family. But Wisconsin isn't always the escape he thought it would be. I loved, loved, loved Rico's voice and his believable vulnerability. This is a long book and it just flew by, but not in that fluffy-fast-read sort of way, but in that way that I just couldn't put it down. It wasn't gripping the way a thriller or mystery is, but I just wanted to keep hanging out with Rico and Jimmy and Gilberto and everyone else on the farm. One of Hijuelos's other book, Mambo Kings Play Songs of Love is an adult title that's been on my to-read list for awhile. It's getting moved way way way up. With a Mexican father and white mother, Danny has never felt like he fits in. When he's in his predominately white neighborhood and school, he's just that Mexican kid, but when he goes down to National City to spend the summer with his father's family, he's the white kid. Still, this summer, getting to know his father's family, playing baseball, will give Danny many answers about who he is. This is a hard one to review. I mean, it's extremely well-written. It's an excellent book. There are a million and one things right with it. There is very little wrong with it except that it's about boys. And baseball. An excellent book that a lot of people will love, but just not my thing.